Route 58 in Halifax, MA separates Monponsett Pond into two water bodies. East Monponsett Pond is picturesque and lovely. West Monponsett Pond not so much. In the summer, the gas-like stink emanating from the pond causes locals to call the fire department to make sure there aren’t any dangerous gas leaks. According to Cathy Drinan, the local health agent, “It’s getting worse every summer. The odors are terrible… they cause headaches.” The smell is emitted by the blue-green algae blooms that smothers the pond every summer without fail. East Monponsett Pond is connected to West Monponsett Pond by a culvert under the highway. Water flows through the culvert from east to west, which then flows out of Stump Brook. Drinking water is pumped from East Monponsett. During late summer and early fall when it’s dry, the pond is lowered even more, which can cause water to flow from west to east. Both state and local officials are actively working to make sure water from the west pond doesn’t contaminate the east. The algal bloom problem isn’t new. 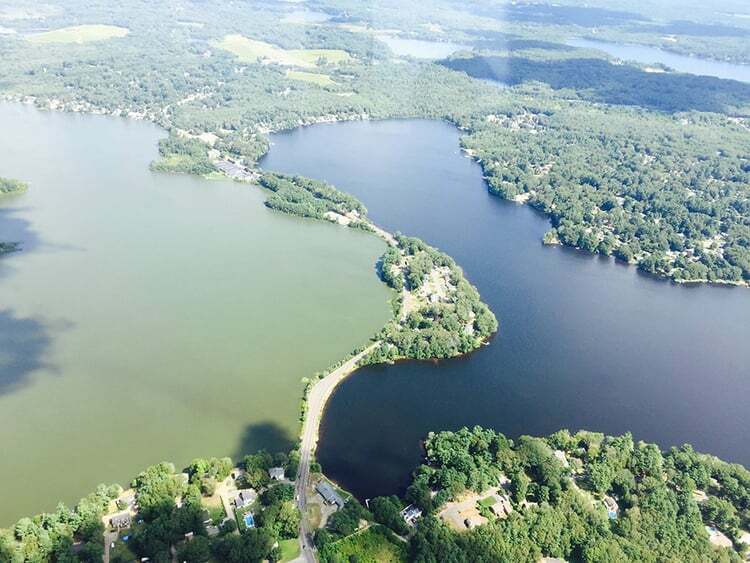 A report published in 1987 blames errant septic systems for leaching polluting nutrients into the pond and fueling the algae blooms. Since then, on more than one occasion, there have been algal blooms with more than twice the cells per milliliter count needed to justify closing a lake (70,000). In fact, in 2013, West Monponsett Pond achieved the dubious record of longest consecutive beach closures in the history of Massachusetts. In June of 2017, Halifax treated West Monponsett Pond with aluminum sulfate to bind to the phosphorus in the water that fuels algal blooms. Unfortunately, the soupy stink returned and the pond was closed in early August. In addition to the treatment, the town has started looking into longer-term solutions, including managing stormwater and limiting runoff from nearby cranberry bogs. The town recently received a grant to prevent stormwater runoff and reduce other sources of excess nutrients in the ponds. This May, the town again treated the pond with aluminum sulfate. Only time will tell if it prevents another harmful algal bloom. This blog post was researched and written by Dorothy Cooperson Vieweg, ORI Summer Intern, with some assistance from others. Since the city of Brockton has control of the level; flow of the Monponsett Ponds, especially the west pond area; they have exacerbated this inexcusable health problem to both the ponds, as well as the residents & unaware users. Because Brockton won’t let the west pond flow as it once was naturally allowed to; the water level has been allowed to be unnaturally high, & most negatively effecting the surrounding residents & businesses. Since, quite probably, these effected people & businesses are not Brockton taxpayers nor voters, the responsible so-called city leadership just don’t give a darn. Anyway, unfortunately, maybe the effected people & businesses need to come together, get an astute lawyer on these issues, & sue the City of Brockton for damages & losses. It really is too bad, but this may be their only recourse. A further question would be…Why hasn’t Plymouth County &/or the State been called to task, & weigh in on the city’s failure? Yes it is complicated. East and West Ponds are the same level. People on the pond and boaters like the water high during the summer. The drinking water is pumped by Brockton, not Halifax. So it is up to Brockton to clean it for their residents. Lawn owners around the lake should only spread one pound nitrogen per 1,000 sq ft per year not the industry recommended 5 lbs. Falmouth made that switch, saving time and money. Today their lawns are no less green than neighboring towns. Fertilizer industry none too pleased.